CoCo: The Colorful History of Tandy's Underdog Computer goes to press, plus a look at the final cover! 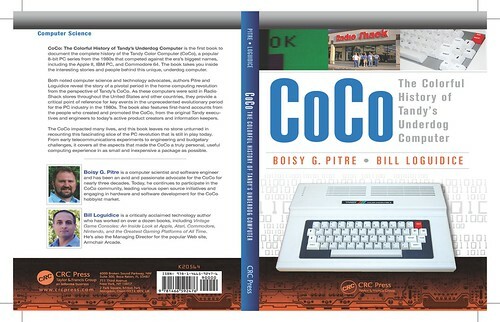 I'm happy to report that CoCo: The Colorful History of Tandy's Underdog Computer has officially gone to press. This means that it should ship out to retail locations worldwide roughly on schedule near the end of December. If you'd like to read more about the book, you can visit the Amazon link or go to the publisher's (CRC Press, part of Taylor & Francis Group) Website. That looks very nice. Very professional. I cannot wait until it is out. I know you had mentioned having me review, but I'm still going to purchase a copy as well. It comes out the end of this month, right? Thanks. Unfortunately, because of the holiday season, publications are all backed up, so it won't actually ship out until the end of December. Stinks, because everything else was way ahead of schedule! I also need to double-check they have the reviewer's list once we get closer. They have it, but it's always good to follow up in case it gets misplaced. December? That's not that long. So instead of a book to read during the holiday season, it will be a christmas present to myself. Not a deal breaker in any sense. I have enough technical reading here to tide me over. I picked up some books on the basics of Electronic Engineering, which I find fascinating, aside from the math which takes some effort for me. I had a Coco 2 as my very first PC...man I loved that thing. In a world that gives the COCO's ZERO love, I'm really excited and thankful that you sat down and wrote something up for the old machine. I'll be looking for a copy for myself and a fellow CoCo'er I know. Well done! Thank you. I'm most proud of the fact that this is not self published. There's nothing wrong with that, of course, but I consider getting a traditional publisher interested in this type of work a major accomplishment. Now we have to hope that that faith gets rewarded with a positive community response (assuming people enjoy it, of course).